Part of the challenge in bringing technology into schools is figuring out what devices work best. By the time a school decides what gadget to invest in, another, possibly better one, comes along. Cheryl Davis addressed this in yesterday’s post about integrating mobile devices into Acalanes School District. Now, we’ll hear from a teacher who's used a few of these devices in the classroom. Liz Pagano is an English and Literacy Teacher at Acalanes High School who’s been teaching for 23 years. Surprisingly, students prefer a smaller but more intuitive device than a bigger and more versatile one. Bottom line: the transition will come, slowly but surely. Q. Which devices have you used and are you using now? Liz Pagano: I’ve used both the Sony Reader and the iTouch as e-readers in my English classroom. Last year I used the Sony Reader to teach Frankenstein to seniors, and the iTouches to teach Dr. Jekyll and Mr. Hyde to freshmen. 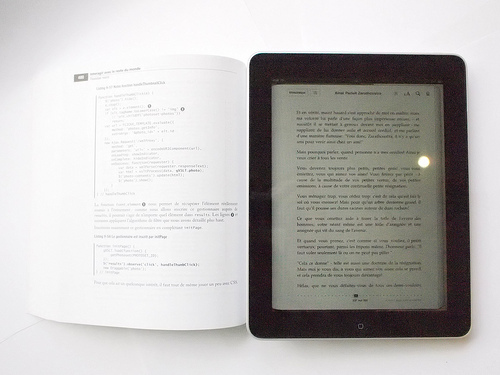 This year, I plan to use iPads as e-readers instead of iTouches because they are larger and easier to read. That said, the iTouches were much more successful than the Sony Readers. At first I was very excited about the way the Sony product had a stylus, allowing students to write directly on the screen. They circled and highlighted words and phrases and wrote their own notes in the margins. There is also a dictionary feature. The problem was with moving between the features (reading, writing, highlighting, etc.) turned out to be clunky at best. Also, the more students wrote, the slower the device became. By the end of the unit, students were quite frustrated and ready to return the e-readers. The excitement they had at the beginning of the unit melted away. Were there any positive features? Yes. For example, if students wanted to find imagery associated with windows, they could search for the word "window" and all of the passages would be listed for them. Secondly, looking at notes in a comprehensive manner is a bit easier. How did students respond to the iTouch? The iTouches were used with freshmen. They were quite excited about using this technology. While many students have such devices, most students don’t see how these tools or toys can help learning. A few students opted not to use the iTouch because they were afraid of breaking them or losing them. Another student or two simply did not want to give up the paper book. However, once we got going with the novella, students were really impressed with how easy it was to look up words they didn't know. (Just touch the word.) They looked up many more words than they otherwise would have, making the vocabulary-dense text of Dr. Jekyll and Mr. Hyde much more accessible. And students found note-taking to be quite easy on the iTouch. This generation is used to texting, so they don’t find it as cumbersome as I do. I prefer taking notes in a book with a pencil in hand. How steep was the learning curve? There was a learning curve, but we probably only spent less than one class period on technicalities. That said, there are different issues with electronic devices. They have to be charged, for example. But the benefits in searching, note-taking, etc. outweighed any negatives. Do you think you’ll transition into e-readers eventually? I believe that we will continue to use books for some time, but that digital reading will slowly make its way into our curriculum. Last year, I was only able to use the technology for one unit per class, because the demand for these devices is high. This year, I hope to use the iPad as more than just an e-reader. I’m exploring the research and presentation applications that the iPad can offer so that students can learn in multiple ways, stay engaged, and be prepared for the working environment they will enter. Do you personally use an e-reader at home? I use both for pleasure reading. I have most of my old favorites in paper. Many more books than you would think are not available digitally, and it seems that most of the things I’m looking for need to be read the old-fashioned way. I also find it easier (for me) to take notes by hand, so for now, that's how I do most of my reading for work. I'm adapting though. That said, carrying a small reading device to read a few novels on vacation takes up a lot less space in my baggage, so I like that.